Dima Kaliakin makes it look like running ultras is fun. Not one to rest on his earlier ultra-exploits this summer, CRR Dimitri (“Dima”) Kaliakin, son of CRR Vic Kaliakin, competed in two more grueling endurance events. On July 28 at 5 a.m., Kaliakin hit the starting line to compete in the Viaduct Trail Ultra 100 miler in Lanesboro in northeastern Pennsylvania. The rail-trail course comprised four laps of a 25-mile out-and-back route. There were 19 (17 men and 2 women) who began the event; eleven (10 men and one woman) finished. Kaliakin was second among those who completed the event, finishing 41 minutes after midnight on July 29—a time of 19 hours, 41 minutes. Even father Vic got a good workout, bicycling alongside his son for 30 of the miles. 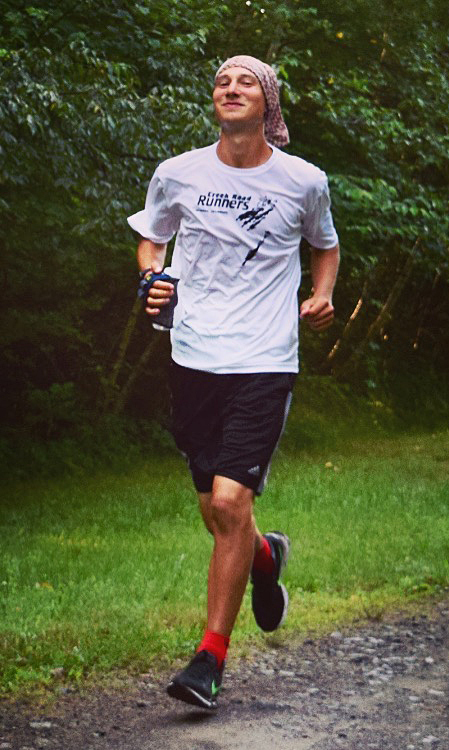 On Sept. 2 of Labor Day weekend, Kaliakin competed in the Labor Pains 12-Hour Endurance Trail Run in Reading, Pa. This trail course consisted of a 5-mile loop including steep uphills and downhills done multiple times. The 23-year-old Kaliakin completed 13 laps within the 12-hour limit, covering 65 miles, finishing second overall out of 400 runners. His official time for those 13 laps was 11:11:38. Note: runners were not allowed out on another loop if they would not be able to finish the loop within the 12-hour total time limit. When 23-year-old CRR Dima Kaliakin races, typically a marathon is but a warm-up distance. On Saturday, May 12, Kaliakin ran the 50km “Dirty German Endurance Fest” in Philadelphia, placing 4th overall out of 190 competitors, winning his age group in the process, in 3:52:23. That’s nearly four hours of running at a 7:28 per mile pace. On June 2, in Staten Island, N.Y., Kaliakin competed in the Saloman OutdoorFest Ultra. The object here was to run as far—as many times over the same 5K loop—as one could in six hours! Kaliakin won this race outright, completing 39 miles (that’s a little over 12-and-a-half 5Ks) in that time and winning by more than a 5K over the second-place finisher. Just four days later, Kaliakin entered a 24-hour charity running event in Annapolis, Md. Laps were supposed to be one mile in length. He managed to do an even 100 laps, only to find out later that the laps were each actually 0.94 miles, so he was disappointed that he had only managed 94 miles. His dad, CRR Vic Kaliakin, who is much more reasonable with his running by comparison, said that Dima “went out too fast,” completing the first 50 laps in a blistering 6:55/mile pace, having to slow up considerably after the 78th mile. Astounding and a more than a bit crazy! On Monday, several Creek Road Runners gathered for a fun 5K down Creek Road in honor of CRR Paul Pusecker, whose time at the University of Delaware is ending this week. Several also gathered afterward for a lunch with him at the Deer Park Tavern. 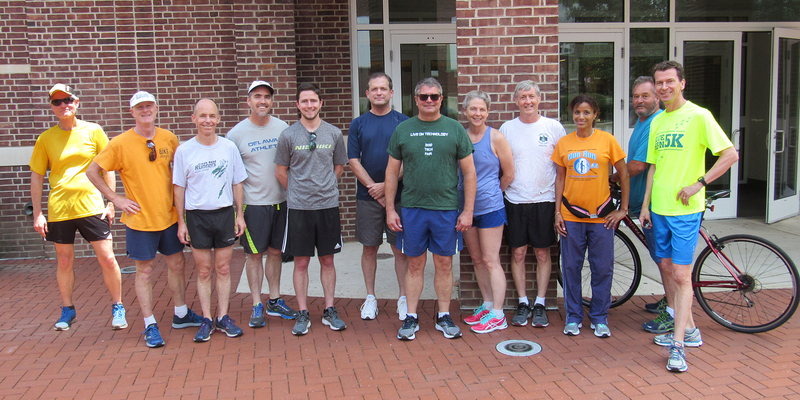 Joining Paul Pusecker (in green shirt) for his farewell 5K were Vic Kaliakin, Mark Deshon, Bill Rose, Jeff Chase, Jordan Deshon, Rick Andrews, Julie Brewer, Steve Goodwin, Flora Poindexter, Avron Abraham, and Bruce Weber. Pusecker, who has served as senior chief business officer for the University of Delaware’s College of Arts and Sciences since 2001, will join St. Mary’s College of Maryland on July 1 as the public honors college’s vice president for business and finance/chief financial officer. Before coming to UD, Pusecker retired from the U.S. Army as a lieutenant colonel after more than 20 years of active duty service. Pusecker has been a “regular” runner out on Creek Road for the 17 years he’s been on campus, along with small group of UD running companions who had popularized the “Lower Slower” and “Chateau Country” runs that were annual staples back in the day. More recently, he’s taken up bicycling to augment his fitness regimen. He will be missed out on Creek Road. In the 11th Annual Main Street Mile race in Newark, two guys with the same last name, who are related only by their fleetness of foot, cracked the top 15 in this short race of 813 participants. CRR Andrew Weber posted the fastest time among Creek Road Runners, finishing 9th overall in a lightning-fast 5:08, good for 2nd in the 30-39 age group. CRR Bruce Weber wasn’t far behind, finishing 14th overall and taking 1st among the 50-59s in 5:32. In terms of age grading, the elder Weber’s time garnered a 90.2 grade, which is considered “world class” for his age group. The younger Weber’s 84.3 is considered “national class.” Both impressive, to say the least. An honorable mention, Newark’s Deputy Mayor CRR Andrew Haines turned in a 7:15. In a much longer race, the Pike Creek Valley Running Club’s annual Delaware Distance Classic 15K, there were four standouts. Of the 191 participants in this race, CRR Bill Farquhar came in 7th overall, finishing in 58:51 and winning the 45-49 age group. Watch out for him within the next year when he turns 50! CRR Keith Crispin took 2nd in the 50-54 age group with a 1:06:38, good for 28th overall. New Jersey resident and one of the original Creek Road Runners, 57-year-old CRR Robert Hesketh, posted a 1:11:37, finishing 45th and taking only 7th place in a tough age group (55-59). CRR Doug Repetti, 66 years of age, was 70th in 1:17:46, and CRR Theresa Kauffman finished 113th in 1:25:52. In the CASA 5K, CRR Bill Rose, running in his first 5K in a year’s time, finished 4th overall out of 38 runners in 19:59. The course was entirely on the University of Delaware central campus in Newark—three laps of The Green. Nothing like a long lap! In a slightly longer race on Sunday, Dimitri “Dima” Kaliakin, youngest son of CRR Vic Kaliakin completed his first ultramarathon, the grueling Tussey Mountain 50-miler, just outside State College, Pa. The 20-year-old Washington College grad completed the up-and-down 50-mile distance in 6:45:34, finishing 5th overall and 4th among non-masters runners. This included a total elevation gain of 5,485 feet, 1,301 feet of which occurred during one 4.1-mile stretch (from the course’s lowest to highest point). Back in May, Dima placed 12th overall out of 326 finishers in the Delaware Marathon in 3:06:07. We shorter-distance Creek Road Runners salute you, Dima!